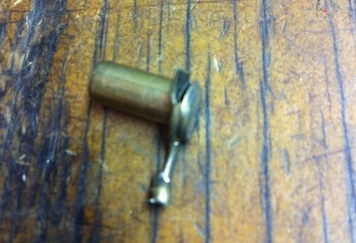 In the course of reviewing the Timney Trigger on my Ruger 10/22, I had a fairly major failure. A case ruptured and sprayed my shooting booth with shrapnel and debris. Just like every negligent discharge (a.k.a., “accidental shooting”) ever covered here, there were multiple breakdowns that led to me getting peppered. The full breakdown of events—including a double fire—is coming in Part 2 of my review of the Timney trigger replacement. Suffice to say, I had a mechanical failure and I did not give it the attention and respect that it deserved. Here are my two main takeaways . . . When a gun fails to do exactly what it is supposed to do, DON’T KEEP USING IT! This is a common sense rule and in my excitement to try out a cool new toy, I compromised my safety and the safety of my fellow shooters. I should have packed it up after the first failure. Instead, I shot at least 10 more rounds. I relied on my eyeglasses as proper eye protection. I know better. I’ve been meaning to get a set of prescription lens cut for some Oakleys I have. They provide far better wraparound protection. While my eyeglasses deflected the major pieces, I still ended up with some soot, residue, and junk in or around my eyes. You only get two. Protect them. I cannot stress enough that the biggest piece of safety equipment you have is sitting between your ears. Use or risk doing your best Stevie Wonder for the rest of your life. What brand of ammo were you shooting? I had a 1911 that went full-auto on me (broken spring). I wasn’t expecting it, of course. The recoil brought the gun up to where it slammed me on the forehead. Lots of bleeding where the sight gouged me, but no permanent damage. Fortunately I was wearing shooting goggles. Yes, that gun went back in the case immediately, and to the gunsmith as soon as I got home. I was working a 9mm AR when it suffered a failure and went into full auto mode. 1: Do not use too much beeswax/lubricant on rounds. 2: Do not cycle the cylinder if you see that the round is not seated properly. 3: Use special care when firing ammunition that has survived a garage fire. I bought a timney trigger for my 10/22 and had the same problem. First it was giving 2 to 4 round burst. I should have stopped there. It later got more frequent. Then a round exploded before it was inside the barrel. My 10 year old and myself got peppered with shrapnel and our ears where ringing. The bullet talked to exit the $300+ barrel. I got it out and got a new trigger group from timney. I got burst with it too. I am gonna call them and see what we can do. Seems like a liability. Shoot safe! Don’t get me wrong though. I like timney triggers. They have some cool triggers. I want one for my ar. I hope this problem can be fixed, because a gun should only do what it is suposed to do.